Der Rosenkavalier has been my all-time favourite opera for many years, and I was curious to see how this first HDVD version would compare with those already issued on DVD. The Dresden State Opera (Semperoper) is highly qualified to present this work, since it was premiered there in 1911 to huge success. 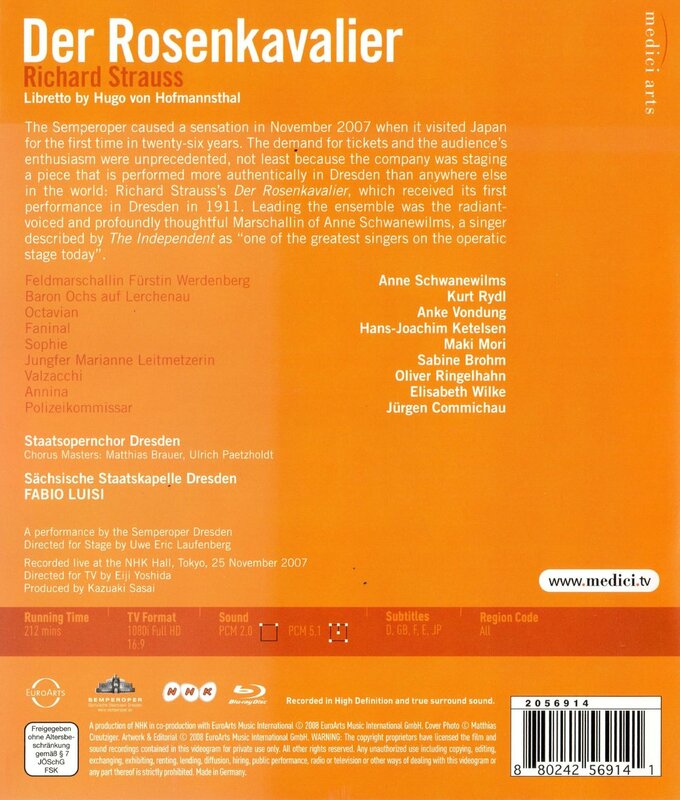 The performance immortalised on this disc was recorded by the Semperoper during it's 2007 tour of Japan. In Act 1, we see the "mature" Marschallin ("Field Marshall's wife" sung by soprano Anne Schwanewilms) with her "toy boy" lover Octavian (sung by mezzo soprano Anke Vondung)---a pairing that is always deliciously ambiguous. (For those new to this opera, let me say that Octavian is a very young male character. The part is written in the mezzo range, so it's usually played by a woman.) This version is particularly delightful and, for me, even more successful than the iconic 1994 performance with Felicity Lott and Anne Sophie von Otter conducted by Carlos Kleiber. The necessity of this "trouser" role is, of course, that Octavian has to dress up as a maid to avoid being discovered in the Marschallin's bedroom by her lusty kinsman, Baron Ochs. The Baron has to find the "maid" sufficiently alluring to want to add her to his long list of conquests. In this version, Kurt Rydl could be accused of overplaying the Baron as a leery, lecherous caricature. But his rudeness contrasts with and gives greater depth to the sublime performances delivered by Anne Schwanewilms and Anke Wondung. In Act 2, Octavian is chosen as the messenger for Baron Ochs to bring the silver rose to Sophie (sung by Japanese soprano Maki Mori), a 15-year old, admirably proper girl, as a formal marriage proposal from the Baron. When it comes to "the sublime", there can be very few moments in any opera, or in any other performance of this opera, to surpass the duets of Octavian and Sophie in this recording. In an appropriately "palatial" setting, Maki Mori's light soprano weaves and blends magically with Anke Vondung's mezzo as they discover the powerful attraction that draws them together in love at first sight. This produces something so wonderful that it makes you weep. Once again there is a stark contrast between this moment of ineffable beauty and the harsh reality of the Baron's earthy vulgarity and Sophie's shock at meeting her "intended" for the first time. In Act 3, Octavian --- once again disguised as the maid --- tries to defend Sophie by drawing the Baron into a trap that will reveal his true nature. This brisk scene, full of weird and wonderful tricks and clever staging, leads to the reappearance of the Marschallin. She bows to the inevitable and, in a final moment of exquisite beauty, "releases" Octavian to pursue his true destiny with the young and radiant Sophie. This EuroArts disc is one of the most moving opera performances I have ever seen on screen or in the opera house. The crispness of the Blu-ray images, the sensitive video editing, and the sumptuous recording of the Richard Strauss score combine to make a powerful case for HDVD being the ultimate way of enjoying opera. Can such superlative productions really be "better than being there"? The jury may be still out on that one. But they should certainly see this Rosenkavalier before delivering their verdict! Sorry, no satisfactory video available for this title.